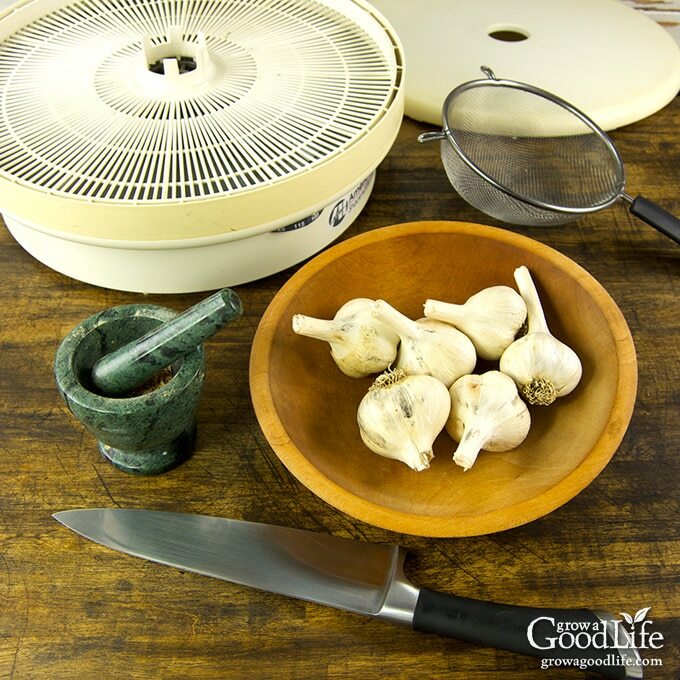 Make your own garlic powder by dehydrating and grinding garlic cloves. If you grow garlic or purchase in bulk and still have an abundance in storage come spring, it may be worth the effort to turn the excess into garlic powder before the cloves go bad. It is a shelf-stable pantry staple: Dehydrating garlic increases the shelf life of your homegrown garlic. 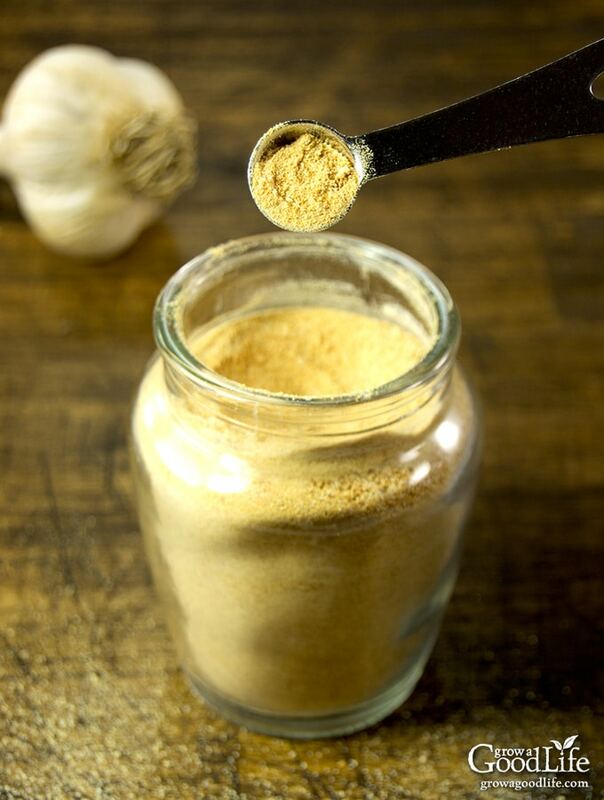 Once dried, garlic powder can last a long time in your pantry or spice cabinet. Garlic powder is a good alternative to have on hand as a backup for times when you are out of fresh garlic. A shortcut for time crunched: There are times when we are in a rush to get a meal together. When taking the time to peel and chop garlic is going to make dinner late, substituting garlic powder is a quick way to add lots of flavor to a dish. The flavor of garlic powder is more concentrated than fresh garlic. Perfect for seasoning mixes: Garlic powder works well in make ahead DIY herb blends, seasoning mixes (such as this Homemade Taco Seasoning), and dry rubs. It combines easily with the other dried herbs and spices to make a shelf-stable mix. Ideal for flavoring ground meats: Chunks of chopped garlic will not soften in ground meats that are cooked briefly, such as meatballs, burgers, and sausage. Instead, use garlic powder to disperse flavor throughout the ground meat mixture. Dissolves into any liquid: Powdered garlic dissolves and infuses when incorporated with liquids, making it an ideal flavoring for marinades, salad dressings, and brines. Adds flavoring as a condiment: Garlic powder can also be sprinkled on almost anything from pizza to popcorn to soups, meats, vegetables, or any edible that may be improved with extra garlic flavor. Use a food dehydrator: A food dehydrator is a valuable kitchen tool for preserving the harvest. It works by flowing warm air through drying screens. For small batch dehydrating, this stackable food dehydrator will serve you well. For larger-scale food dehydrating, consider one of the Excalibur dehydrators. Other ways to dry garlic: If you don’t have a food dehydrator, you can dry garlic slices by layering on drying screens in a warm room or passing a threading needle through the slices and hanging to air-dry. Be sure the slices have spaces in between so they dry evenly. You can also use your oven to dry garlic using one of the lowest heat settings. For most ovens, this is between 150-200˚F (67-93˚C). 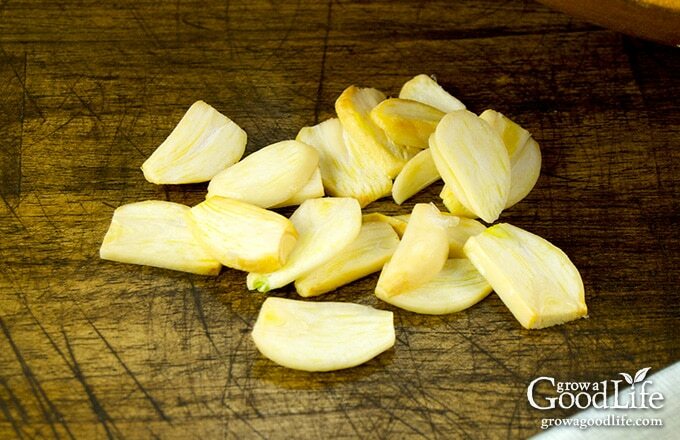 Slice the garlic evenly: Try to slice your garlic cloves in uniform pieces, so they will dry at the same rate. If your garlic slices are different thickness, check the dehydrator several times during the drying process, and remove the pieces that are finished before the others. If you are dehydrating a lot of garlic regularly, it may be worth it to invest in a garlic slicer. This dual purpose garlic press tool both slices and minces garlic. It will even slice garlic with the skins on. Dry at low heat: Dry slowly and at low heat. You may be tempted to turn up the heat to speed things up, but you run the risk of bitter garlic. If the garlic gets brown during drying, it will be bitter. The goal is to let it dry gently, while still retaining the flavor and aroma. Dehydrate garlic in a well-ventilated area: The smell of garlic will infiltrate your home. If you can, locate your dehydrator in an area that is very well ventilated, such as a screened in porch. Take your time: Dehydrate your garlic can take up to 12 hours, depending on the humidity level in the air and how thinly you sliced your garlic. It is ok to turn the dehydrator off at night partway through and start it up again the following day. Dehydrate until the garlic snaps when you bend it. To prevent garlic powder from clumping: Add a teaspoon of uncooked grains of rice to the container of garlic powder. The rice will absorb excess moisture and help prevent the garlic from clumping. Remove rice before using garlic powder. Step 1: Remove the cloves from the head of garlic. Peel off the papery skins, and slice the cloves thin. 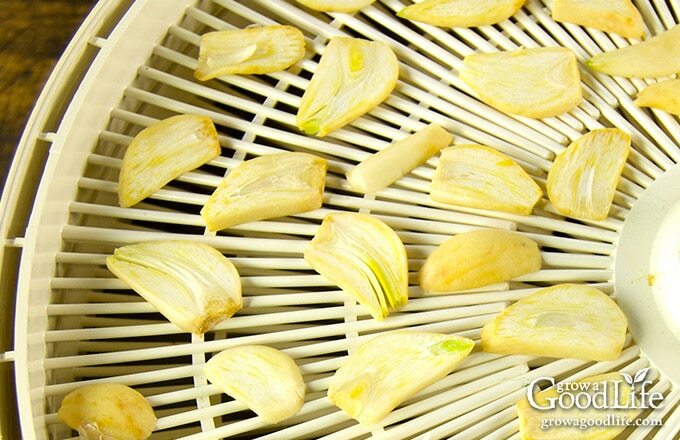 Step 2: Lay the garlic slices on the dehydrator screens, and dehydrate at a low temperature until the garlic is dry. 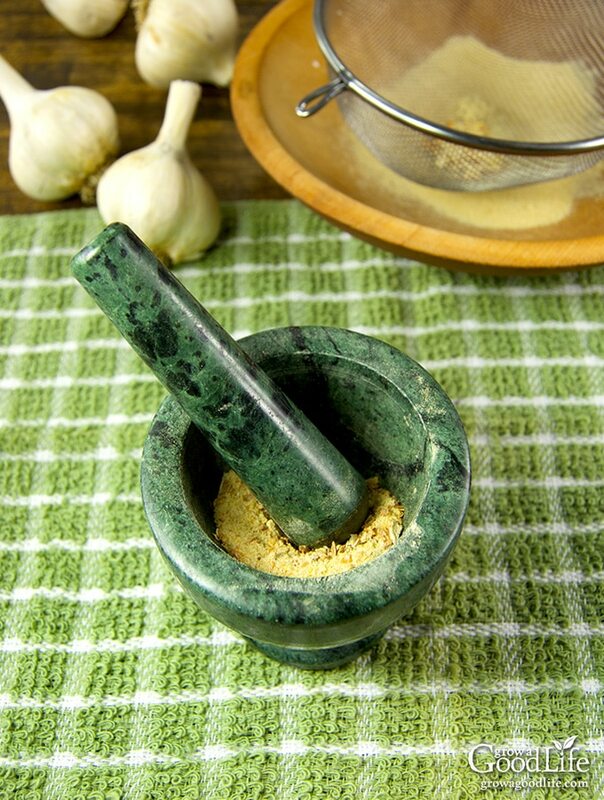 Step 3: Use a mortar and pestle, high quality blender, spice grinder, or coffee grinder to grind dehydrated garlic. Then sift the ground garlic powder through a strainer to remove larger pieces. The larger pieces are ideal for using in soups and stews where they will rehydrate, soften, and add plenty of flavor. Step 4: Store your garlic powder in a glass container with an airtight lid in a dark, cool location. I fill a small jar with garlic powder for my spice cabinet, and then store the rest separately in mason jars in my food storage area. Properly dried and stored garlic powder will not spoil, but the flavor diminishes over time. Make your own garlic powder by dehydrating and grinding garlic cloves. Separate the cloves of garlic from the head. Peel off the papery skins, and slice the cloves thin. To dry garlic using a dehydrator: Spread out the sliced garlic in a single layer on the dehydrator screens and dehydrate at 125˚F (52˚C) until the garlic is crispy and snaps when you break it, up to 12 hours. Rotate your screens several times to dry evenly. To dry garlic in an oven: Spread the sliced garlic on a parchment lined baking sheet and dry in a preheated, 150-200˚F (67-93˚C) oven for 1-2 hours until the garlic snaps when you break it. Let the dehydrated garlic cool, then grind into a powder using a high quality blender, spice grinder, or coffee grinder. Sift the powder to remove large pieces, and store the garlic powder in an airtight container in a dark, cool, and dry location. 6 large heads of garlic will make about 1/2 cup of garlic powder. Substitute 1/8 teaspoon of garlic powder for each clove called for in recipes. Such a great idea! 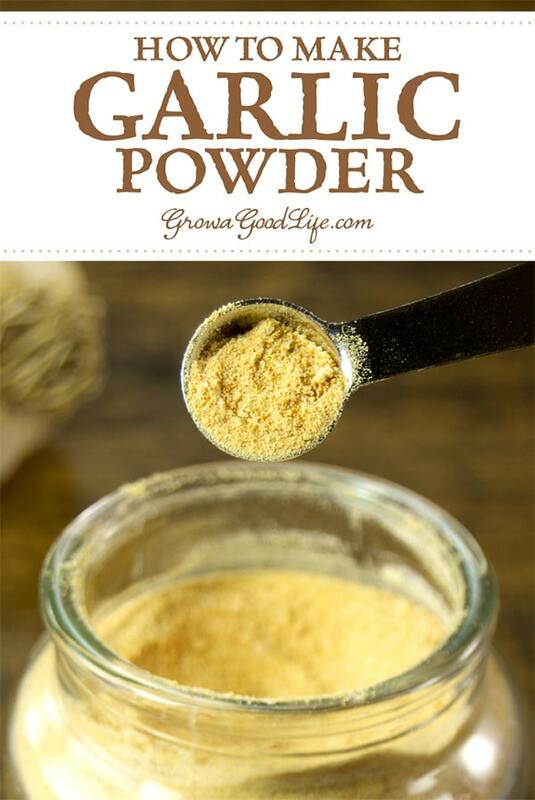 I never attempted to make my own garlic powder and I didn’t realize that it’s this easy! Definitely something I need to try out. Thanks for your well-written article on making our own garlic powder. I’m also interested in putting a good bit into gelatin capsules to use as a regular for health. The history on garlic and history back to Abraham, Egypt, Greece, and Rome is outstanding. I’m 84 (born 1934). After WW2 I heard several American soldiers tell of the Russian soldiers carrying bags of garlic with them. Our soldiers called it: Russian Penicillin. Apparently, it goes beyond the level of fiction. It has a reputation for helping clear blood vessels and being good to prevent cardiovascular problems. Its main contribution to health may be in keeping infected people away from our garlic breath. Ratih, I am not sure. I have never tried it because the sun isn’t very warm where I am located. I bet it would work for warmer climates though. 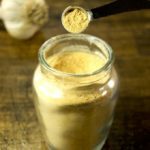 I never thought about making my own garlic powder! Thank you for the idea.